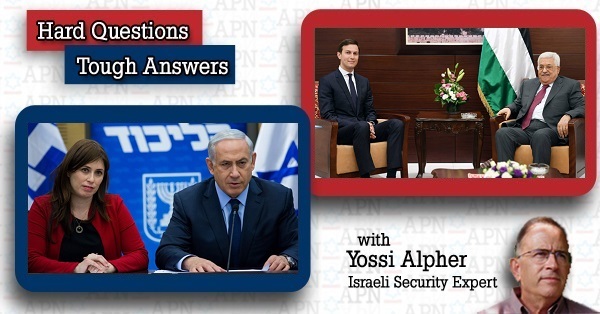 This week, Alpher discusses Deputy Foreign Minister Tzipi Hotovely's disparaging remarks about American Jews; pessimism regarding the likelihood that the Trump administration’s anticipated Israeli-Palestinian peace plan will succeed; and the international legal backdrop to the Netanyahu government's refusal to negotiate with a Palestinian unity government and Russian FM Lavrov's declaration that Iranian forces are in Syria legally. Q. Last week, Israel’s Deputy Foreign Minister Tzipi Hotovely made disparaging remarks about American Jews. Can you put this in the broadest possible Israeli context? Regarding being disinvited to speak at Princeton Hillel: “liberal dictatorship”. Second, who is Tzipi Hotovely? She is messianic ultra-nationalist orthodox. Upon assuming her current position, she convened Israel’s diplomats and told them to explain to the world that the West Bank belongs to Israel because God gave it to us. She herself “fought for her country” by doing two years national service at the Jerusalem shrine to the spiritual father of the religious settlers and as a Jewish Agency emissary in Atlanta. Recently she was invited to speak at Princeton University’s Hillel chapter, then disinvited when protests were voiced over her views. Possibly some of her recent pique reflects this demeaning experience, which is indeed inexcusable. Third, beyond Hotovely’s record, Israel has a broader national service problem of its own. The Ultra-Orthodox, more than ten percent of the population, are for the most part exempt from service. So are Orthodox women, though some like Hotovely volunteer for some sort of non-military service and a trickle volunteer for the IDF. Israeli Arabs are exempt but a handful volunteer. Indeed, the overall proportion of Israeli youth who serve in the military these days is not far above 50 percent. Fourth, needless to say, American Jews do volunteer for the US military. And a slowly growing number volunteer for the Israeli military. As for the Kotel, considering the way it is currently administered I can easily understand why any self-respecting non-Orthodox Jew, American or Israeli, keeps his/her distance. Fifth, and probably most important, Israel overall is becoming more nationalistic and more religious. Hotovely’s ultra-nationalist sentiments are shared by an alarming proportion of Israelis. The causes go beyond Netanyahu, his politics and his coalitions, and include the effects of suicide bombings some 15 years ago, the failed peace attempts of prime ministers Barak and Olmert, and the widespread perception that the Palestinian leadership is incapable of making the necessary compromises and is still committed to Israel’s demise. Appointing Hotovely to her current job is merely one small example of Netanyahu’s ultra-nationalistic and anti-pluralistic bias. The government as a whole is behind a divisive conversion law and denial of pluralistic prayer at the Kotel. Minister of Education Naftali Bennet is responsible for grossly expanding Orthodox influence in the Birthright program, in Israel’s contribution to Jewish education in the US and in education for “values” in Israeli schools. The Ultra-Orthodox, who for the most part aren’t even Zionists, periodically are allowed to hold the entire government and all of Israeli society hostage to their anachronistic and un-democratic demands regarding transportation, kashrut and the nature of the sabbath. Non-Orthodox Diaspora Jews (who are the vast majority) should know that this Israeli government increasingly disparages a large proportion of Israelis, too: those who still believe in pluralism and basic human rights; those whose Zionism and patriotism do not include gobbling up West Bank territory and disenfranchising Palestinians; the seven percent who now define themselves as Reform Jews; the 58 percent who support the right of women to pray on a totally equal footing at the Kotel. Let’s not forget it was Netanyahu who famously said that secular Israelis “have forgotten what it is to be Jewish”. In his search for American support for his positions regarding Iran and the Palestinians, Netanyahu has consciously and willingly allied himself with American Orthodox Jews and evangelicals. Knowing Netanyahu, he assumes that if and when he again needs the support of the broader American Jewish mainstream--and that day will inevitably come--he can replace more obnoxious spokespersons like Hotovely (who of course has already apologized to American Jews for her remarks), make a few speeches of clarification, perhaps ask Yehoshua to say a few words, and re-galvanize support. Q. You frequently express great pessimism regarding the likelihood that the Trump administration’s anticipated Israeli-Palestinian peace plan will succeed? Why? It hasn’t even been unveiled yet. A. There is absolutely no indication that Trump’s plan will succeed any more than its predecessors. Neither PM Netanyahu nor the PLO’s Mahmoud Abbas (see below for clarification on the latter’s relevant title) has shown the slightest inclination to make the concessions necessary for an end-of-conflict two-state agreement. Recall that a much more willing PM Olmert and Abbas were unable to conclude a deal in 2008 when, as Abbas stated, “the gaps were [still] wide”. Since then the two populations have become even less likely to soften their hard-line positions. And the Middle East has become far less stable, rendering it all the more difficult for either Israel or the PLO to risk making far-reaching concessions. Further, if Hamas, against the odds, is integrated into the PLO, its influence on negotiating positions will render them more extreme. Nor are Trump’s innovations likely to help. “Economic peace”, meaning Arab and western investments in Palestine that are promoted by the Trump administration, has historically proven unlikely to persuade Palestinians to radically modify their political negotiating positions, which are religiously and ideologically-based. The prospective involvement of Saudi Arabia and other Gulf countries will almost certainly be limited to investments and perhaps a few confidence-building gestures to Israel. None of this will persuade either side to significantly moderate its positions. Nor will Saudi Arabia--even assuming that under volatile reformer Mohammed bin Salman it remains a stable country, which is by no means a certainty--offer Israel genuine normalization of relations until and unless an Israeli-Palestinian peace agreement is signed. Beyond all these by-now familiar impediments to progress, we must bear in mind that Trump’s negotiating team members are pro-settlements, that it has not (yet?) endorsed the two-state solution demanded by the Palestinians and other Arabs, and that it has pledged not to try to impose a settlement. At this point, it is fair to predict that the Trump plan projected for 2018, like the Kerry process of 2013-14, will prove counter-productive and will engender instability and violence, not peace. Q. The Netanyahu government “won’t negotiate with a Palestinian unity government”. Russian FM Lavrov declares that Iranian forces are legally in Syria, and Israel protests. What’s the international legal backdrop to these misunderstandings and why is it important? A. The Oslo Accords, as ratified by the United Nations, remain the effective international legal framework for final status negotiations between Israel and the Palestinians. Oslo specifies that the Palestine Liberation Organization is Israel’s negotiating partner. The Palestinian Authority, which was created in accordance with the interim autonomy provisions of Oslo and which is run by the Palestinian government, is not Israel’s peace negotiating partner. The PLO represents Palestinians everywhere; the PA only those in the West Bank and Gaza Strip. Accordingly, a unity government that integrates Hamas into the administration of the West Bank and Gaza is not a prospective peace partner and an Israeli government that rejects it as such is simply displaying ignorance. When negotiating with the Palestinian leadership, Israel is talking to Chairman Abbas of the PLO, not President Abbas of the PA.
Further, Israel will be hard put to reject contact with a PA unity government. Israel and the PA have extensive daily dealings regarding security and the movement of people and goods into and out of the West Bank and Gaza Strip. Note in this regard that the latest Fateh-Hamas unity agreement facilitated by Egypt projects both a PA unity government comprising Hamas as well as the integration of Hamas into the PLO. The critical issue here will be whether Israel agrees to negotiate with the PLO if and when it includes Hamas alongside Fateh. For the time being, however, this is little more than a theoretical question. The new unity agreement, like all its predecessors since 2007, does not appear to be making progress toward fruition. Turning to Iran’s status in Syria, Lavrov is correct. Under international law, a foreign force may enter a sovereign state only at that state’s invitation. Syria, which despite (or alongside or because of) the horrors of the past six years remains sovereign under President Bashar Assad, has invited Iran and Russia to send forces; no one else. Large Turkish military forces in northern Syria and a sprinkling of US and other allied military “advisers” in northern and eastern Syria are, under international law, invaders. Israel’s forces in the Golan Heights since 1967 are also technically invaders, even though Israel can claim to have occupied them in self-defense, it has unilaterally annexed the Golan, and Syria to this day maintains a UN-monitored ceasefire agreement with Israel. The most significant ramification of this legal reality is that Israel’s demand that Russia see to it that Iranian forces leave Syria or at least take their distance from the Golan is, under international law, meaningless. Only Syria can tell the Iranian forces on its territory what to do. Whether Israel and Russia can reach some understanding on this issue under the laws of realpolitik is a different matter entirely. Hard Questions, Tough Answers (9.25.17) - Kurdish independence, Palestinian unity, Israel-Arab warming: real or fake news?